In Darkness Blu-ray Review. Difficult to watch in parts, In Darkness is a moving true story that reaffirms that in even the darkest of times there remains a light, dim though it may be. 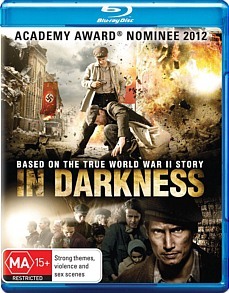 Nominated in the category of Best Foreign Language Film at the 84th Academy Awards, In Darkness is an oftentimes harrowing and claustrophobic film that dramatises the true story of Catholic Sewer worker Leopold Socha, who uses his familiarity with the layout of the sewers to hide a group of Jewish refugees in Lwów during Nazi occupation. Initially seeing an opportunity to benefit financially off of the horrors of the war by agreeing to hunt stragglers that have eluded authorities during the liquidation of the ghetto, Socha soon stumbles across some surviving Jews who had managed to avoid deportation or slaughter who offer him a more money if he’ll keep them hidden and provided for. A former thief, Leopold is tempted by the promise of a regular payday and agrees to assist. Looting homes abandoned by the Jews with his accomplice Szczepek and hunting Jews for pay, Leopold isn’t your archetypical hero. Unaffiliated with either side of the conflict, he embarks on a risky endeavour that may put his family at risk, not for reasons of altruism but for the simple purpose of sating his own greed. One feels that if the Jewish survivors didn’t have enough money between them to trump the Nazi’s price on their head, he would have turned them in at the drop of a hat. Starting the film morally ambiguous and motivated by dubious voracity, Leopold isn’t the most likable of protagonists and certainly isn’t portrayed in the same light of adulation as, say, Oskar Schindler. But that’s what makes him so relatable as a character; he has the failings and simple trappings of many of us. He’s not some idealistic hero valiantly fighting against the Nazi regime, just an ordinary, slightly morally bereft civilian caught in the middle of an attempted genocide, doing all that he can to ensure survival. Eventually, as you’d expect, he has a change of heart once he starts to get to know the ragtag bunch of survivors and their children; once the money runs out and the stakes for harbouring refugees become more severe Leopold finds himself willing to stand and fight for those that he once viewed only as dollar signs. A dark story, both literally and figuratively due to the underground setting of much of the film, In Darkness is an exercise in tension, with a scene regarding the fate of a newborn whose cries may alert soldiers to their hiding place bringing the gravity of the situation crashing home. The sewer scenes are oppressively dark, with most of them being lit using only flashlights. This gives the film a gritty, cloying atmosphere that makes you feel palpably uneasy and adds further authenticity through the use of multiple languages rather than have everyone uniformly speak Polish. Socha’s personal journey from opportunistic thief to patriarchal saviour is extremely convincing, predominately due to an effervescent performance by Robert Wieckiewicz. Films regarding the Holocaust can be a hard sell to some audiences; attempts to distil the atrocities inflicted down to two hours can come off as insensitive in relation to the magnitude of the actual events and the now familiar cookie cutter plot of underdogs overcoming great odds risks becoming trite. The more cynical among us may even suggest that these films exist solely to tug the heartstrings and to serve as Oscar bait. 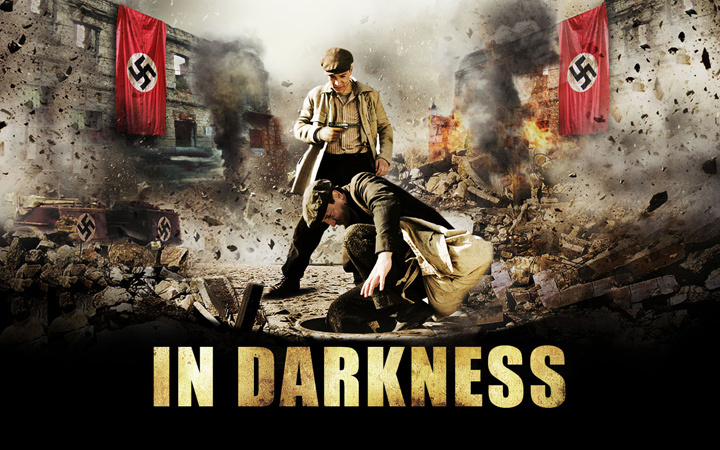 In Darkness manages to deftly avoid these pitfalls for the most part and although it’s blatantly obvious where the story is heading, the journey is well worth it and offers up some surprising twists to subvert your expectations. By not lionising its protagonist, In Darkness manages to offer a starkly human perspective on one of the darkest chapters in history without feeling too self-congratulatory or minimising the impact of these monumental events. Although a generally dark film, the image quality of In Darkness is superb. Filmed digitally, the transfer captures every minor nuance in incredible clarity, from the texture of clothing to the perspiration on Leopold’s face. Simply put, this is one of the best transfers currently available on the market, easily competing with bigger budget Hollywood fare. For a film that spends so much time in the dark, black levels are paramount and the Blu-ray pulls off this feat admirably, with sufficient shadow in scenes without sacrificing detail, even in low light. There is no aliasing or blocking visible throughout and, although the film has a muted colour palette, occasionally a dizzying splash of yellow or blue will jump out at you, dazzling you with its beauty. The image is vivid and sharply detailed and is hands down the finest transfer I’ve seen so far this year. Audio is in DTS-HD MA 5.1, quickly becoming the Sony standard, and it is spectacular. Ambience takes precedence over music for the most part, but when it does come to the fore the soundtrack is intelligently handled, used to enhance the pathos of the scene. Clarity is impeccable, with the audio levels consistently crisp and no noticeable drowning out of one element in favour of another. Top marks all round in these areas. 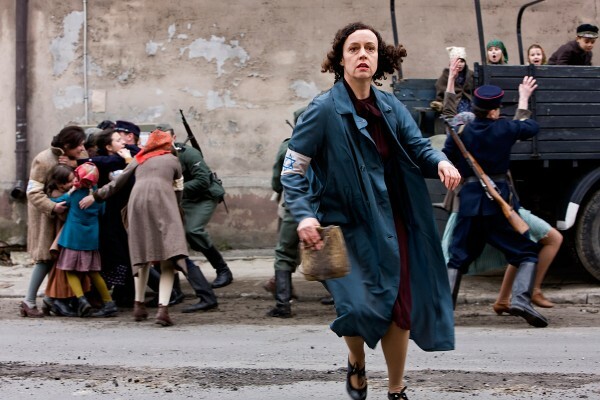 There is only one supplemental feature of note, in which after the film’s completion Director Agnieszka Holland finds out that one of the subjects of the film was actually still alive. Organising to have a meeting together, Holland and survivor Krystyna Chiger discuss the parallels between the film and personal experiences. This is a fascinating excursion into the mind of someone who has personally experienced some of the worst atrocities of the Twentieth Century and provides quite a bit of insight into the liberties taken with the story, the dichotomy between societal conventions between Europe and America and of course the experience itself. A great companion piece to the film, deleted scenes that were omitted from the final print are also interspliced throughout. The memory of the Holocaust serves to speak of mankind’s capacity to commit acts of horrendous cruelty but also to remind us that there are those of us who resist and fight in the face of overwhelming odds. Inspiring stories such as this highlight the heroism of ordinary people and the risks they took to save the Jews during this awful time of persecution. Difficult to watch in parts, In Darkness is a moving true story that reaffirms that in even the darkest of times there remains a light, dim though it may be. The characters of the refugees could have benefitted from a tad more characterisation and at times the atmosphere can be so oppressive it can be physically and mentally draining, but by the end of the film the uplifting reaffirmation that there is always hope, no matter how slim, is the message that you walk away with. Highly recommended.